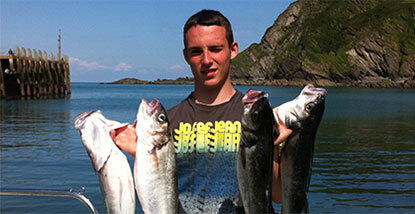 Fishing trips, Lundy Island transfers, swimming and diving with seals and much more! 4 hour deep sea fishing, our most popular trip! Join us on a 2 hour reef trip aboard Jay Jay. 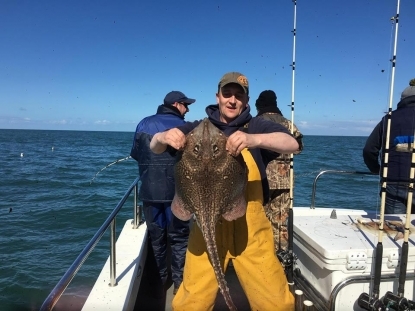 We head out from Ilfracombe to fish for species such as pollock, codling, wrasse, gurnard and bass on the many reefs and wrecks along the North Devon coast. Rods and tackle are provided or for those experienced anglers among you feel free to bring you own rods and lures. Trips run from Easter to October. From Easter until October we run our 4 hour deep sea trips. The Bristol Channel offers some great sport fishing for species such as conger eels, tope, ray, bull huss, bass and pollock. All rods, bait and tackle are included. We use fresh or frozen mackerel for bait depending on what is available. You can also arrange for specialist baits such as crab, squid and lug worm to be onboard at an extra cost. Please email for details and prices. Our rods and reels are all under 2 years old and are regularly serviced and filled with new line to increase your chances of a specimen catch.